You Can't Stop This Lin-Manuel Miranda EGOT Train! With his Oscar nomination this morning, Lin-Manuel Miranda is like a quarter of an inch closer to an EGOT and thus peak insufferableness. As we predicted last November, the Hamilton star and king of ALL musicals has picked up an Academy Award nomination for Best Original Song for writing the music and lyrics to Moana’s “How Far I’ll Go,” which is in the running with a pair of La La Land songs (“Fools Who Dream” and “City of Stars”), Justin Timberlake’s dumb No. 1 hit “Can’t Stop the Feeling” from Trolls and “The Empty Chair” from Jim: The James Foley Story. 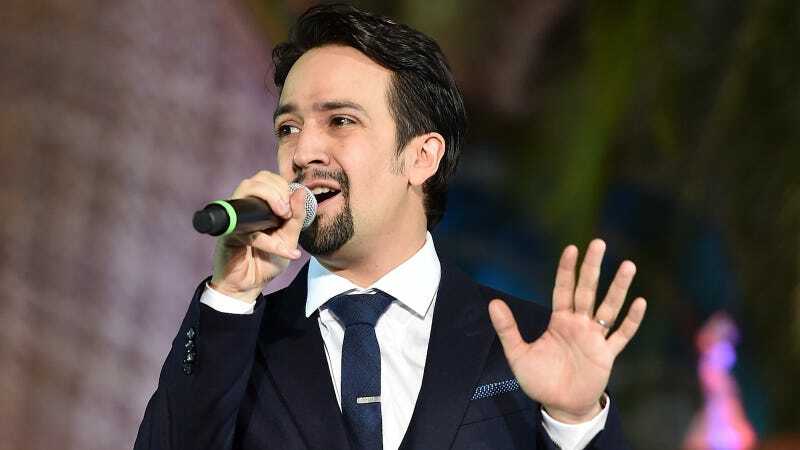 His EGOT clock started ticking in June 2008 when he won his first Tony for the musical In the Heights. That means that an Oscar win would come less than nine years later — one year earlier than Lopez’s even decade. Lopez also started his decade-long journey by winning a Tony in 2004 for Avenue Q.
That’s Robert Lopez, who’s among the 12 entertainers to EGOT, along with Richard Rodgers, Helen Hayes, Rita Moreno, John Gielgud, Audrey Hepburn, Marvin Hamlisch, Jonathan Tunick, Mel Brooks, Mike Nichols, Whoopi Goldberg and Scott Rudin. Here’s the song that will get him there.